Contact us for fast delivery and competitive prices of accessories and spares for your vehicle recovery equipment or skip and hook loading equipment. Powertec Vehicle Engineering has over 20 years of experience in the manufacture of specialised recovery and transportation equipment. As a market leader in the supply and manufacture of vehicle recovery bodies, skip loading equipment and hook loading equipment, we offer our customers a very high quality conversion at very competitive prices. Engineered to recover, built to lift and built to last. Flexible options for skip loading equipment. 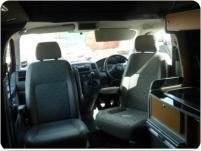 We can supply you with a brand new or used VWT5, or we can successfully convert your VW T5. Please contact us for all your recovery vehicle needs.